Yeah, but: My very first Review By Proxy. 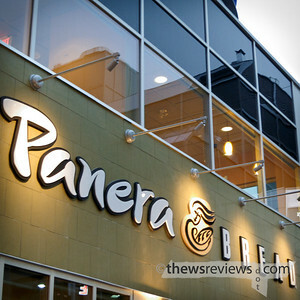 The Long Version: I've never eaten at the new Panera Bread location on Yonge street at Edward, and based on what I've heard from other people, I never will. Despite only being open for one week, I've had four of my co-workers spontaneously start to rave about it, and I hear people talking excitedly about it on the street. Panera, or so I'm told, serves excellent soups and sandwiches. The prices are not quite cheap, but they're not out of line compared to other quick-service restaurants in the area, including the ones that don't leave people misty-eyed at the mention of a "bread bowl". This is exactly the sort of thing that I love, which is why I am never, ever going inside. A wise man once said: "I've bought crack cocaine three days in a row. I'm starting to worry that I'm a shopaholic." I'm fighting mightily against a similar shopping issue. This blog doesn't use the star rating the way Amazon or similar clod-source sites do. Here an average score is only a modest 2/5, which is still a positive recommendation; Panera's basic concept of soup and sandwiches is good but so well established that even donut stores do it. But when I start my unsolicited raving that means a rating of a solid four out of five, which is an exceptional score. Given how many people have been telling me about Panera I had to consider a perfect 5/5 on their execution, but I just can't go that high without trying it for myself.